Note: Ice Rink tarps are listed as a cut size - finish size is 3% to 5% smaller. 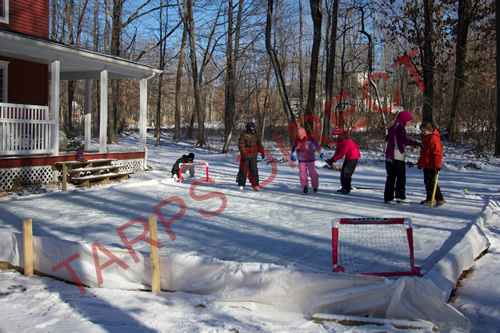 Tarps Direct's Ice Rink Liner offers an economical solution for creating your own cold weather fun. Our heavy duty white 6 ounce poly liner is tear resistant, water proof and stays flexible under Arctic-like conditions. The liner is UV treated for protection against sunlight. The grommets are spaced approximately every 18 inches on all sides for your convenience in securing the liner inside your structure. To ensure you get the greatest life from your liner, it is recommended that the ground be checked for any item that could puncture the material such as rocks, sticks and anything of a sharp nature. Depending of the depth of your frame, your liner will need to be large enough to cover the bottom and sides. 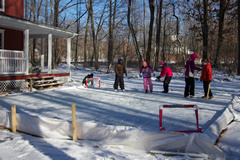 You will need to order a liner several feet larger than the actual footprint of your rink. Sharp blades will puncture the liner - so use care when entering and exiting the rink.